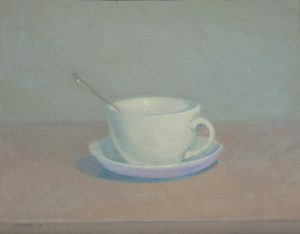 “Afternoon Tea Cup” was accepted into the “Spectrum” show. The opening reception is on Friday, April 20, from 6:00 – 8:00 PM. Hilary Lewis, the Chief Curator and Creative Director of the Glass House was the judge. I am very honored to have had a painting selected. The show will be up until May 24. Gallery hours are Wednesday – Saturday from 10:00 – 3:00 and Sunday from 1:00 – 5:00. The Carriage Barn is located in beautiful Waveny Park at 681 South Avenue, New Canaan, CT.